We had great Annual meeting on Monday, March 28th. A group of 30+ members heard first hand about some of our plans for 2016, but more importantly a discussion session led to lots of great ideas. Hopefully we can move forward with some of the great suggestions and enthusiasm that was present in the room! 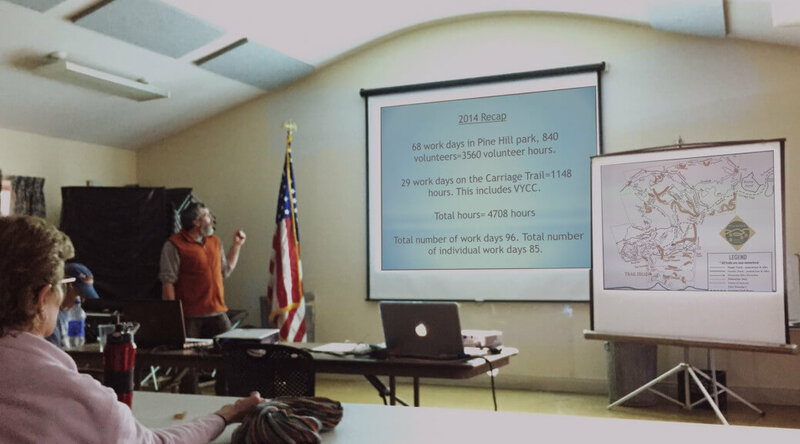 Projects completed in Pine Hill Park in 2015 highlighted in blue. 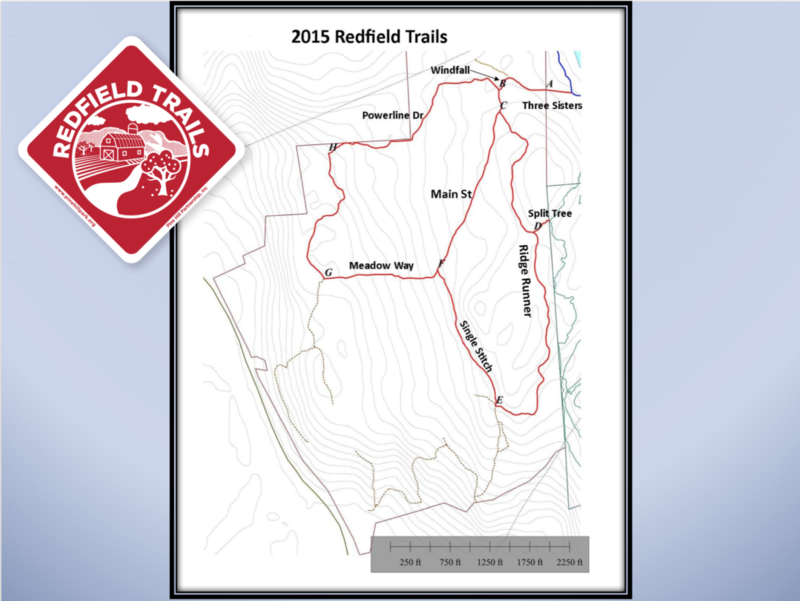 Redfield trails opened and blazed in 2015 highlighted in red. The meeting then moved on to an open discussion of 2016 plans. 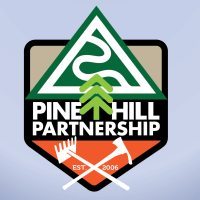 The current PHP board has been working on redefining the goals for the organization and President Andy Shinn shared some of their thoughts. The board reached out to those present and to the overall membership for help in steering the group forward. 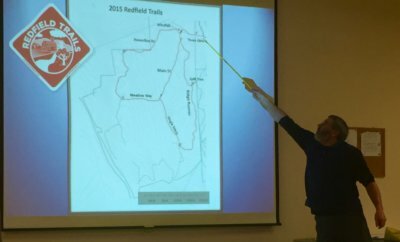 In addition to the usual annual tasks like trail maintenance, the board is hoping to recruit folks to help with some new projects. 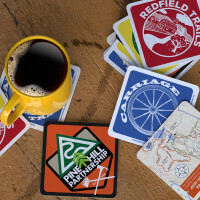 The partnership has developed a new logo and designs for coasters, t-shirts and plans to produce tyvek maps for next year. Much of the discussion centered around how we could increase awareness and enthusiasm for the work we do, and how we could translate that enthusiasm into more paid memberships and volunteers to help the board accomplish our goals. Ask if member? Do you want to be a member? At activities have a table or something to sign people up. 59 paid members this year; where do we want to be next year? Membership drive? 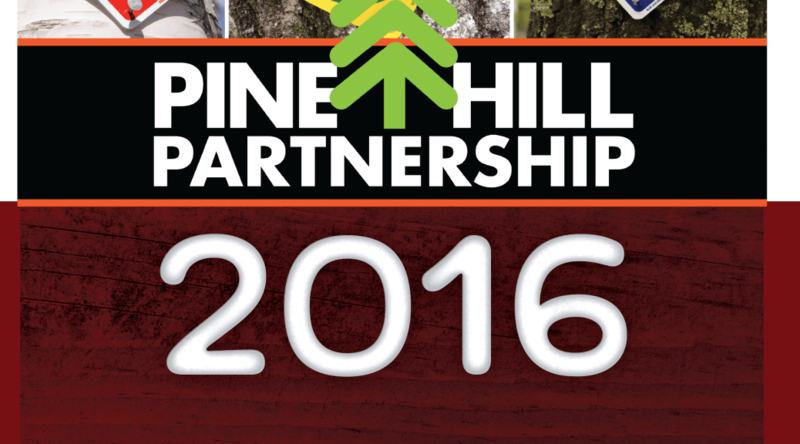 Get list from Cindi of 600+ emails to get them to sign up for Pine Hill Partnership. Might need membership card ? 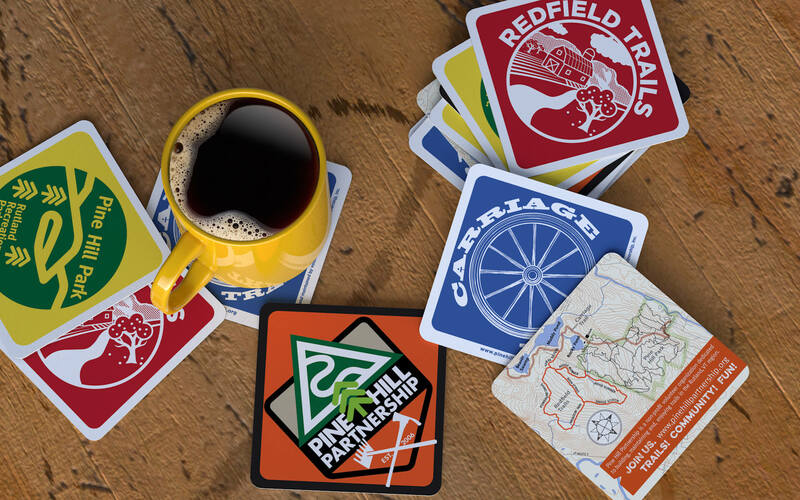 Trails are all the same and some users want a variation on trails – more difficult terrain. Make Broken Handlebar Extension be something more than just a roller. 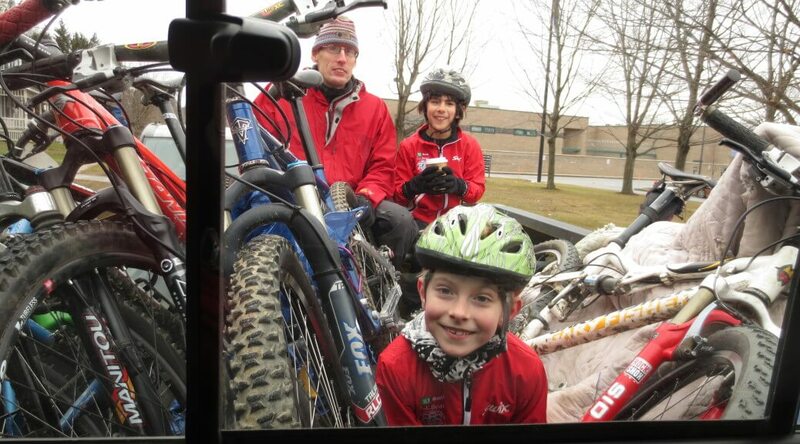 Optional routes giving the chance to take a more technical or rocky trail. Something different. 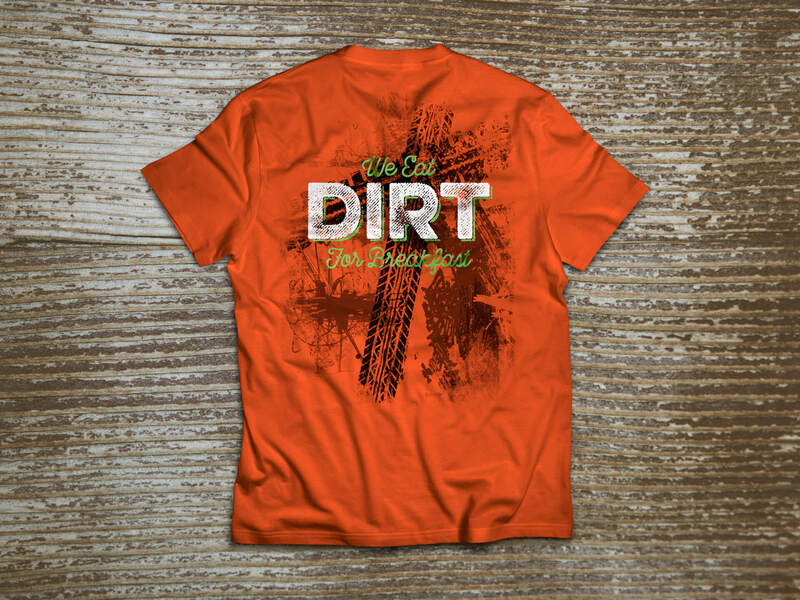 Broaden the trail system. Mailing list on maintenance? People find out a week after the items happen. How things are presented is important – make it fun or at least sound fun; add something like a barbecue or ride or similar. Need someone to organize B-B-Que for a work day. Evening work times? Get more people for a shorter time. Need someone to step up and lead these groups. Put it out that we need X many people, leader, etc. 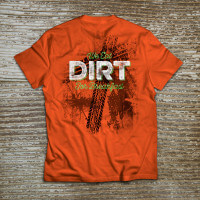 Trail building 101? 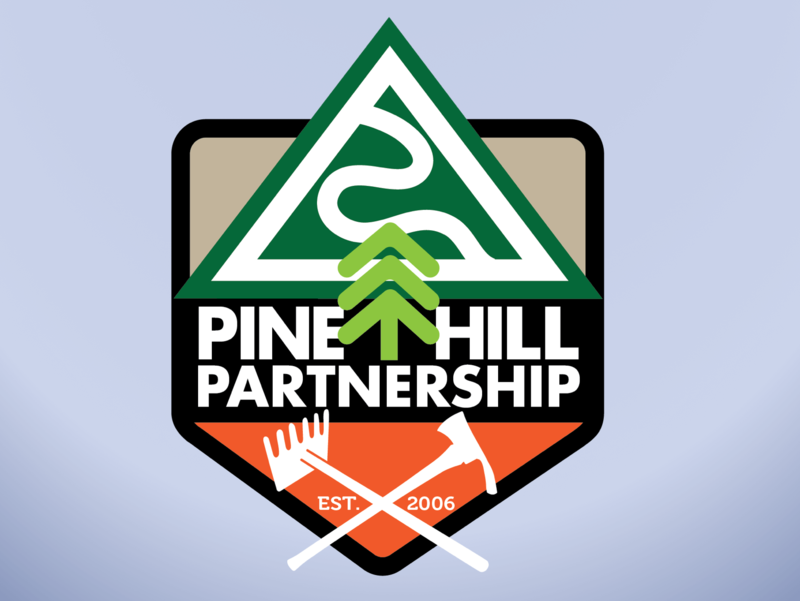 Teach some leaders how to do trail maintenance and lead a group. 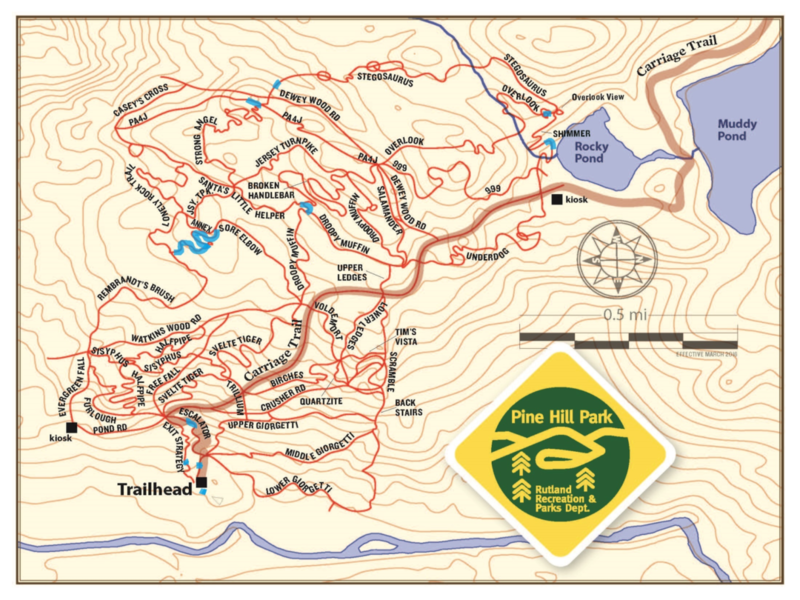 Why are the trails closed? 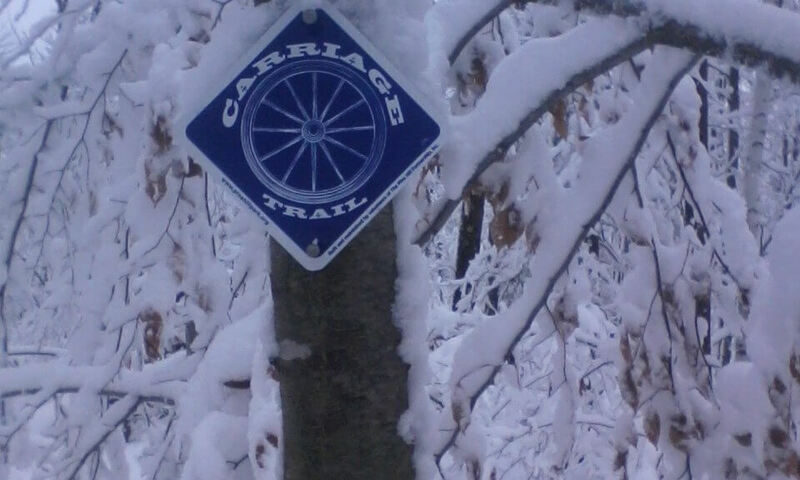 Educate as to why the trails are closed because people may not understand this especially given the mild winter. After the discussion the final piece of business was to elect next year’s board of directors. Our board of directors for 2016 are: Joel Blumenthal, Andy Shinn, Keith Wight, Shelley Lutz, Claus Bartenstein, and Dave Jenne. 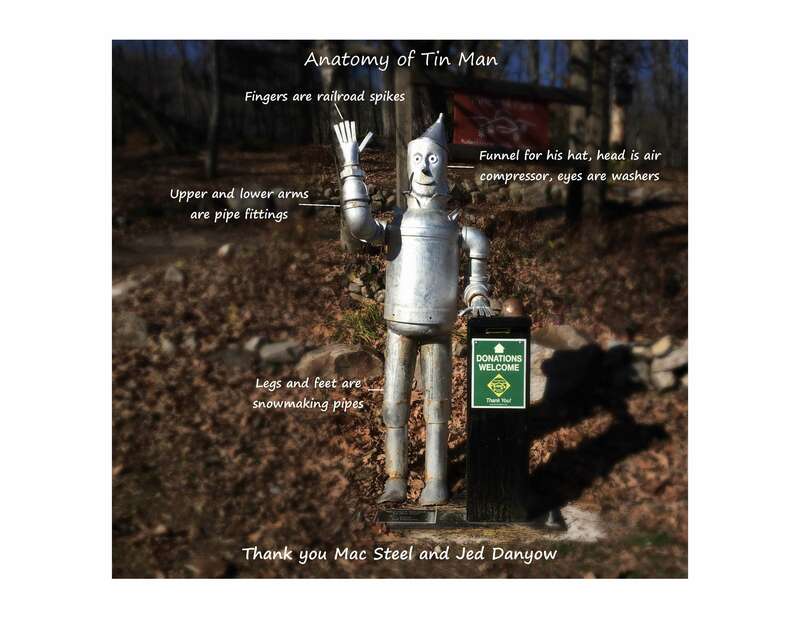 Big thanks for your support this year in our continued efforts to make these area trails so special. 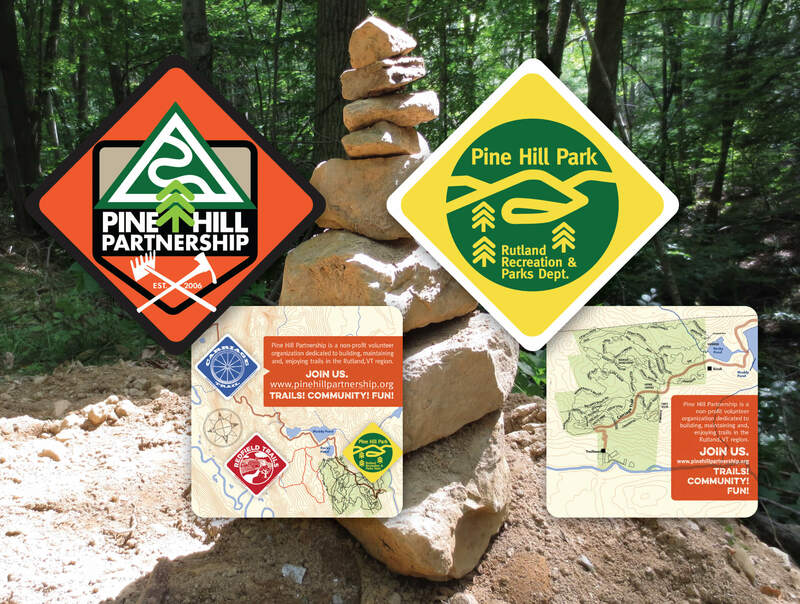 Have you ever wondered how parks and other outdoor “natural” recreational venues are created? Often, as I walk among the trees and over the rocks on our region’s trails, I try to imagine the shovels and rakes, chainsaws and axes that many a hand must have wielded in order to create a path for my boots to traverse. And if I am really in a state of imagination, I try to trace the work even further back in time to the meetings and the sketches and the friendly — and sometimes not so friendly — arguments over land ownership and rights-of-way and fundraising and promotion that surely must have occurred long before a shovel ever touched the earth. For many long-time Rutland City residents, the transformation of the area that is now Pine Hill Park is the one illustration of such work. Surely the same can be said for the Pittsford trails, the D & H trail, Northwood Park, and the many other recreational networks in our community. 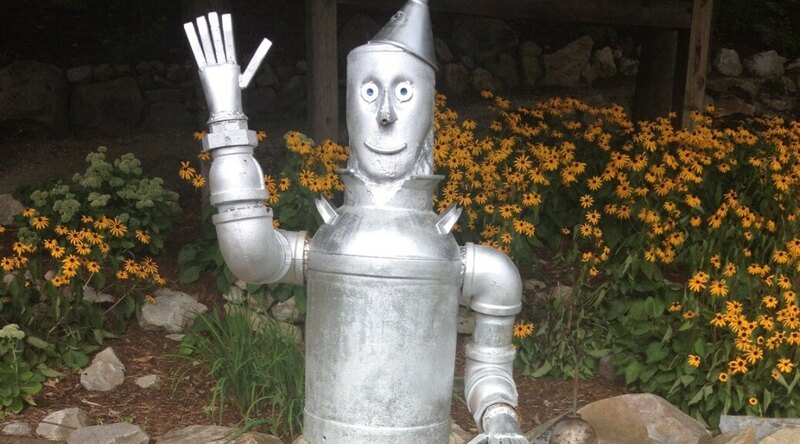 As part of the work RAPAC is doing with the Rutland Regional Planning Commission under the Vermont Department of Health’s Healthy Community Design Grant, I was recently part of a meeting just like I imagined. 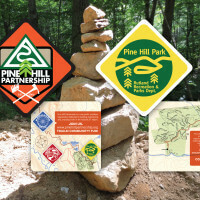 Folks from the Pine Hill Partnership board, regional commissioners from Mendon and Hubbardton, and local citizens all came together on June 15 to pour over a map of the region; assessing existing trail networks, deciphering what plots of land are public or private, and coming up with dream trail connections to join towns or peaks, or just continue a trail past its current termination. I was in awe of the knowledge each of these individuals carried about the woods and the back roads and the mountains in our region. As a group, there was seemingly no rock, no old bridge, no bend in the river that wasn’t familiar. And so, as we began to look dreamily at the potential for expanding and connecting the regional trail system, it felt as though the sky was the limit. One such dream that is quickly becoming a reality, is the proposed Jim Jeffords State Forest. 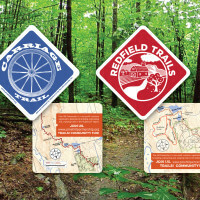 Linking Coolidge State Forest and Aitken State Forest in Mendon and Shrewsbury; the 100,000+ acre land conservation project will not only provide our region with over ten miles of hiking, mountain biking, skiing and snowmobile trails, it will also offer conserved habitat for Vermont wildlife such as moose, deer, turkey, bear, trout, songbirds and more, providing a resource to hunters, anglers and birdwatchers as well. Acquisition of this land is currently being managed by the Trust for Public Land, along with a group of volunteers. A significant portion of private land has already been donated, and some funding to support more land procurement has been secured through private donation and public grants. The project team is currently working on a campaign to raise the remaining funds for the forest. For more information on the Jeffords State Forest, contact Kate Wanner at the Trust for Public Land: kate.wanner@tpl.org. 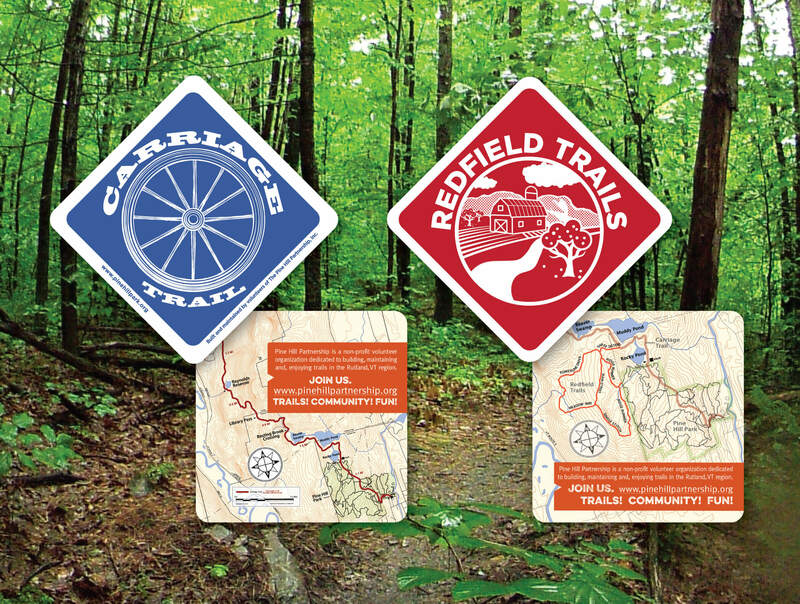 While the Jeffords State Forest is one example of the beginnings of a new park/maintained intentional recreation space, it isn’t the only. 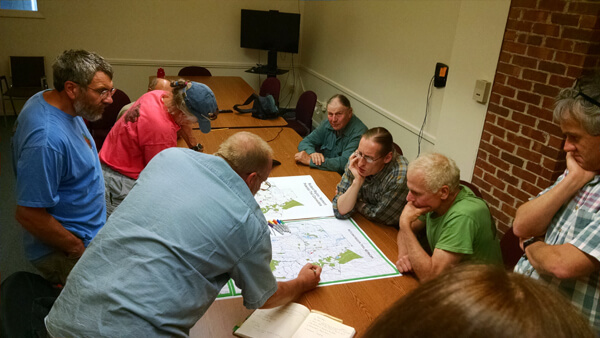 June 15th’s meeting yielded quite a few new dreams; listing Class 4 roadways as potential mountain biking paths, revisiting old rail beds, and even highlighting Otter Creek as a water trail for canoeing and kayaking were all just bits of thought to be sorted, mapped and explored in the (hopefully near) future. We are so fortunate to live in a state where opportunities for outdoor, exploratory recreation are virtually everywhere. I look forward to the continuance and further development of such opportunity for myself and generations to come. 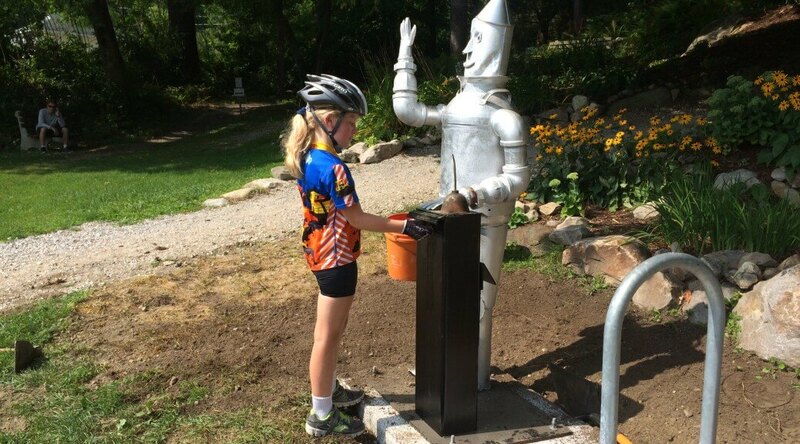 Kimberly Griffin is the Director of the Rutland Area Physical Activity Coalition (RAPAC) whose mission is to promote and increase bicycle and pedestrian activity in Rutland County. 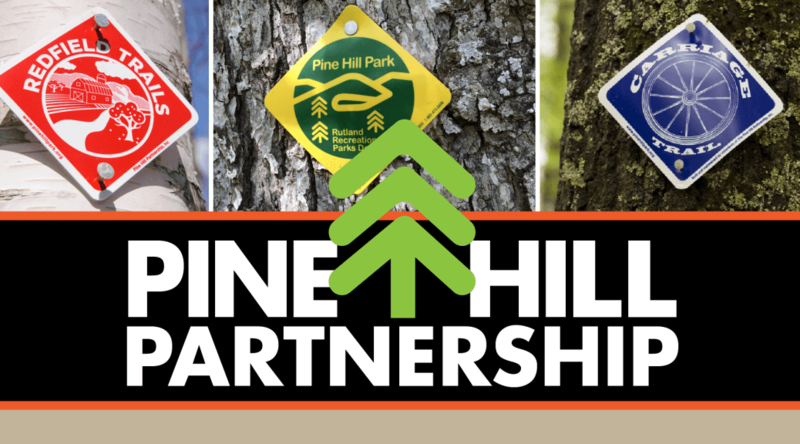 Pine Hill Partnership is a key component in keeping Pine Hill Park, Carriage Trail and Redfield trails in tip-top shape. Please consider making a contribution of any amount. We are a tax deductible 501 (c) 3 non-profit.